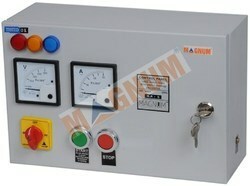 MAGNUM Three Phase Submersible Pump Control Panel Gold is a powerful controlling device for your submersible pump made with heavy duty components, it switches & protects your pump from hazards caused due to over-current. Fitted with toroidal type current sensing preventer which can be used to protect the motor against single phasing. Fitted with voltage selector rotary switch to read phase to phase voltage between all phases.